I've been missing all the good stuff out there lately. (Maybe I've been spending too much time on the blog.) 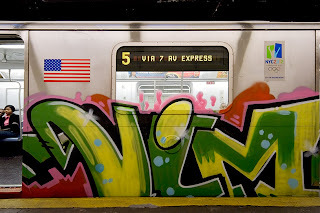 Yesterday, a team of guerilla artists took over one of New York's subway cars. But it wasn't like the old days when artists covered the trains with graffiti (see above). These artists stated their intentions in advance: "commuters will be greeted by welcome mats affixed to the floor in front of each door. Curtains will be hanging from the windows, houseplants attached to the overhead bars, and magazines will be distributed for reading pleasure. The subway ads will temporarily be replaced by 'family portraits' and images of book and record collections. Carpeting will be installed. The artists themselves will be relaxing in the car, wearing their pajamas and enjoying coffee." Sure enough, they pulled it off. (Despite the fact that New York's transit cops are famously humorless.) You can see some fabulous pictures in this New York Post story. Just one more reason New York is the greatest place on earth. So I guess these people r trying to make this city the luxury city all around right? This sounds like something the group Improv Everywhere would do. They've done a ton of subway decorating, including a haunted house. And they're in NYC too!